Exceptional architecture stands in the face of the negative aspects of commercial globalisation by celebrating the spirit of individual place; and by being rooted in its culture, its geography and in the experience and value systems of the people that have created it. By drawing from work across the world, this issue of AD will demonstrate that it is possible for architects, designers and engineers to design outstanding buildings that sustain a sense of local identity, both in terms of cultural heritage and the conservation of the environment. In the last few years, a groundswell of critical resistance to the homogenised imposition of a form-driven universal architecture, which defies local context, has continued to grow unabated, as has developing interest in an alternative pathway to the design of buildings. 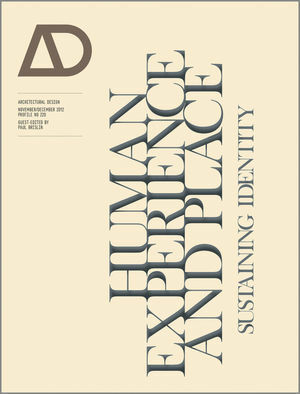 Human Experience and Place will be launched at the third ‘Sustaining Identity’ symposium at the V&A in London in November 2012, curated by Paul Brislin and Juhani Pallasmaa and co-partnered by Arup Associates, the V&A and Architectural Design; and featuring contributors to the issue. ‘Sustaining Identity’ gathers likeminded exemplary practitioners of an architecture of resistance together on a biannual basis: an alternative avant-garde whose work sustains human identity through its focus on specific culture and place. Contributors include: Peter Buchanan, Ricky Burdett, Farrokh Derakshani, Murray Fraser, Jayne Merkel and Juhani Pallasmaa. Features include: Arup Associates, Sean Godsell, Bijoy Jain (Studio Mumbai), Rick Joy, Diébédo Francis Kéré, Jonathan Kirschenfeld, Christopher Lee (Serie Architects), Li Xiaodong Atelier, Josep Lluis Mateo, Pezo von Ellrichshausen Arquitectos, Wang Shu, Woha and Kongjian Yu (Turenscape). Paul Brislin is a practicing architect and Director of the multi-disciplinary architectural practice, Arup Associates. Paul has curated a number of international symposia at the V&A in London with Juhani Pallasmaa dedicated to the topic of an architecture that sustains human identity through its focus on specific culture, place and human experience. Paul is the editor of the work Arup Associates: Unified Design, and is an editorial board member of Architectural Design (AD).